The main port with its 1200m long quay is located in Gruž district. All intercity and international ferries run from this port as well as most of the local ferries with exception of the Lokrum island ferry and Cavtat boats which run from the old town port. Ferries leave from the pier at the southern point (to the left of the port building) while the cruise ships usually berth to the north (right of the port building). The distance from the port to the old town is approximately 3.5km - a 45 minute walk. Buses 1A and 1B run back and forth every 10-15 minutes until past midnight during summer. car parking for 300 cars, shuttle bus service to the old town and back, information offices, newsstands, food and beverage areas, luggage deposit and a lost and found service. 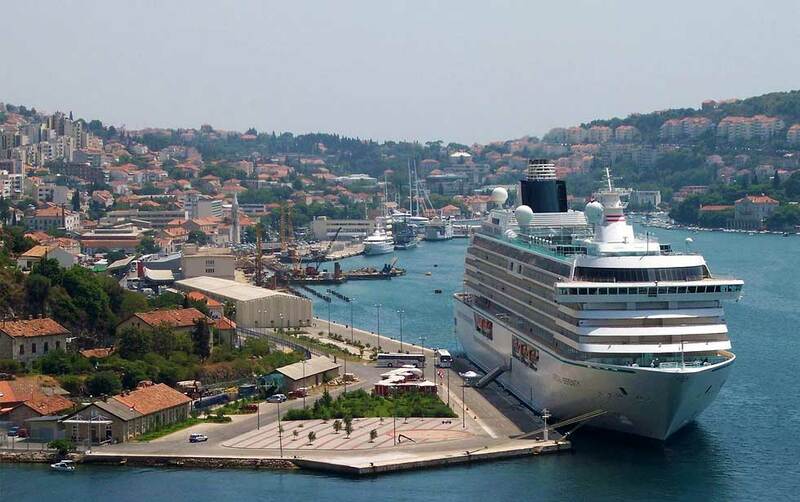 In the past several years Dubrovnik has become one of the major cruise ship destinations on the Mediterranean and due to a big interest from cruise companies, it also has to limit the number of cruise passengers. In most cases the number of cruise passengers is limited to up to 8.000 per day, a number which is still discussed about as many of the ships arrive at the same time and leave at the same time, causing a floating congestion zone in the whole city. Just imagine 10,000+ cruise ship guests, about 3,000 guests and 40,000 inhabitants on a bit over 21.35 km2. Point made.